A couple of years ago, my birthday present to myself was a chocolate making course at a local pastry school. It was an all-day course and we learned how to manipulate chocolate into various forms – including how to temper chocolate by hand. Tempering chocolate is extremely difficult and takes years to master. I’ll quickly explain the ‘essence’ of tempered chocolate – it’s when the crystals in the chocolate form to create that shiny appearance and the nice firm snap when you bite into a properly tempered bonbon. I’ve had chocolates that were improperly tempered and let me tell you, nothing is more disappointing than a mealy, dull piece of chocolate that melts all over your hands. Yes, an additional perk to tempered chocolate is that it won’t melt at the slightest touch of human hands – it stays intact and is fairly shelf stable, which is why tempered chocolate is such a desired skill to have for any aspiring chocolatier. Anyway, chocolate is melted, then cool and then SLIGHTLY warmed up again to 88C – at which point it is ready to be worked with. It’s a very, very delicate art and I admire anyone who can do it successfully. I’ve avoided tempering chocolate on my own (even though I was gifted a marble slab) because it is so labour intensive, but after creating some fantastic bonbons in Chicago, I may be tempted to try it again. This was a real commercial chocolate tempering machine, cycling out a steady stream of cocoa goodness that was begging to be molded, shaped, folded and enrobed into sweet delights. My eyes nearly popped out of their sockets when I saw it for the first time and chef had to (jokingly) warn us, “do not put your faces into the chocolate machine!” I’ll be honest. I was tempted. We got to work with the machine right away. One of our first projects was to fill chocolate molds with pear caramel. And we needed to make the molds! So off we went to collect a container of chocolate! Our setup: chocolate mold, sheet pan lined with parchment, chocolate spatula, and of course – chocolate! A chocolate mold, for those unfamiliar is kind of like a fancy ice cube tray. Instead of simple cubes, there are fancy patterns and shapes and it can be made of silicon or food grade plastic. (I’ve seen some metal ones but are seldom used) We held the mold over the sheet pan and tipped it on a slight angle (towards the pan) and poured the chocolate over the mold, ensuring that each cavity was filled. We tipped the mold on a steeper angle for the excess chocolate to run off and using the spatula, we firmly rapped the sides of the mold to knock out more chocolate. Once we had an even and fairly thin coating on each cavity, we used the spatula to scrape off the chocolate from the flat surface of the mold. All the excess chocolate was salvaged on the parchment paper, which was placed in the chocolate cooler so that it would later be added BACK to the machine (no waste of chocolate allowed!). Those were the only molds that we used, but we went back to the machine fairly consistently to get chocolate to enrobe our trios, truffles, lollipops and to decorate our cake. 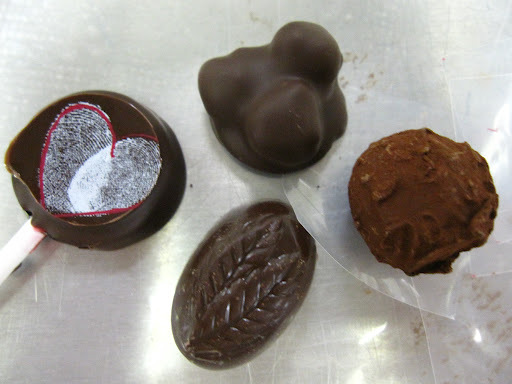 With the trios and truffles, it was fun to handle the chocolate by hand – it’s something I’ve always enjoyed. After taking the course at the Vancouver Pastry School with Chef Ropke, I’ve always paid close attention to the feel and temperature of tempered chocolate. Although thermometers are handy and are a good gauge, I believe Chef Ropke’s philosophy that to know when chocolate is ready – “just put your hands in it!” The consistency and temperature (successful or not) will be evident to the touch. 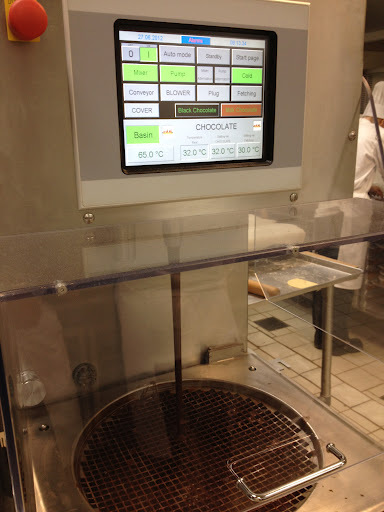 Actually – now that I think of it, we used another kind of chocolate mold to create our trios. The trio bonbon that we created was a cluster of three caramelized hazelnuts that were placed on a chocolate disc and then enrobed in chocolate. We used a thin and flat mold with small circular cutouts to create the discs on a Silpat. We then placed the cluster of nuts on the disc (while still in a liquid state) and let them firm up in the cooler. well. We didn’t dip the cake in the chocolate – although that would have been amazing!! 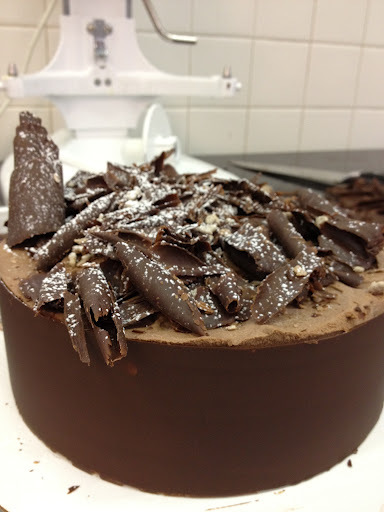 We created a ‘ribbon’ of chocolate that would encircle the outside of the cake and then curls to adorn the top. We used a strip of acetate (thick, food grade plastic) that we measured and cut to the diameter of our cake. We poured a small amount of chocolate on the acetate and then using an offset spatula, spread the chocolate along the length of the acetate strip. We quickly wrapped the strip (chocolate side FACING the cake) around the cake, making sure that the edge of the strip was flush to the base and that the ends of the strip overlapped. After a few minutes in the cooler, the strip was removed and voila! Our cakes were being hugged by a beautiful band of chocolate. So it serves and aesthetic AND structural purpose! It’s certainly a tip I will adopt when I make complex cakes in the future. Of course, no ‘masterpiece’ cake is complete without chocolate curls! This was done very easily – we poured some chocolate on our stone counters (not sure if they were marble or granite) and using an offset spatula, quickly spread out the chocolate into a very thin layer. The thinner the layer = the faster it will set. I also discovered that a thinner layer of chocolate yields more delicate curls. My partner had not created as thin of a layer and the curls I created using that chocolate were a bit bulky, and to be honest, did not have the nice crunch as the thinner curls. In any case, it was fun to do and added a lovely topping to our cake.